I always top of my Indian meal with either Payasam or Rice Pudding or Gajar Halwa. 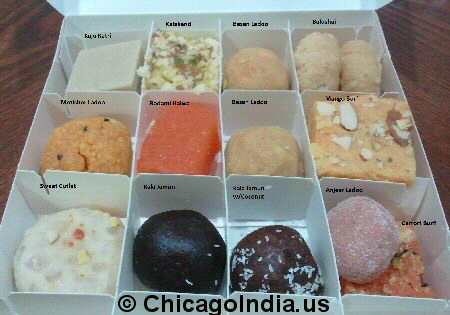 If you have a sweet tooth like me, there are several mithai shops on Devon Ave in Chicago where you can satisfy your sweet cravings. Whether it is Chocolate Barfi, Rasogolla, Chum Chum, Arise, Kajjikaya, Jalebi, Motichor Ladu, Mysore Pak, Punjabi Pinni you get them all and more at Devon Ave Indian sweet stores. In addition to the sweets, Chicago Indian Sweets stores also offer spicy Indian snacks like Kara Boondi, Plantain Chips, Mixture etc as well.